Take a look at the future. What do we see? Microsoft? Google? Apple? Yeah, you are right, none of them! The future is DMK Creator 6.3 Shark Edition. The technology involved was brought from the deep Atlantic Ocean. Be careful what you will do with this tool. It is dangerous. One blink and all your stuff will be cloned. - Wouter: This version is a killer one. - Manuel: Incredible! Is there a better word to describe it? 1 - Now it copies perfectly Tower of Gazzel, one of the most MSX Protected Disks Ever. 2 - Some minor bugs fixed. 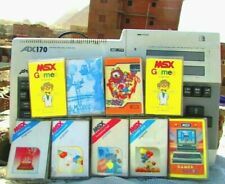 But report: DMK images made on a Sony MSX2+ (HB-F1XDJ) won't work. OTOH, images made on a Microsol interface or on a Philips NMS-8245 will work fine. I have a XDj Sony computer here and it Works Fine. First I tried with the Pana Amusement Collection, but then I tried with a disk that I myself have formatted and just saved a "TEST.BAS" file. Same results. My XDJ is expanded internally to 512KB. I also tried to use an external 1MB memory mapper (ReproFactory), but the results were still the same. FDSAVE.COM can read the disks just fine. (But on Pana Amusement Collection you have to ask it to ignore the protection sector at the beginning of the disk, of course). In all tests (XDJ, NMS-8245 and Hotbit+Microsol) I used my IDE interface (upgraded to Nextor). Sure. I created DMK creator using a XDJ computer and did all the tests. But now I realised that I sold it. I have here now a Sony XD computer that has the same Floppy Disk Controller. It has just 64k of RAM and because of that I use an external megaram of 2 MB and an external Megaflashrom, using Nextor, of course. I will try to create a DMK file of one of my protected disks as my first test. I will put the results here tomorrow. I created 3 DMK files from 3 protected disks. All perfect dumped. 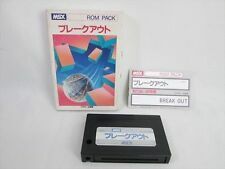 To dump this disk with DMK Creator, I used an external 2 Mb megaram cartridge. 2 - Chave Mestra 3: Protected Disk Copier. To dump this disk with DMK Creator, I used the 512k memory mapper in megaflashrom. To test it, you need to do the same as in the case above. 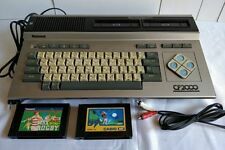 Can the bug be reproduced in openMSX? Well, for me the main difference is the "IDE" used. The computer is pretty much the same hardware for this test. I used megaflashrom and he used his own IDE. And as I told here before, I developed DMK Creator using a XDJ Sony computer. A good test would be to press "D" key to disable memory expansions using just the main RAM. (32k). Another good test would be to boot using DOS1 and just disks to make the DUMP. 2 formatted disks to receive the DMK files. Pressing "Control" during boot is good. Not necessary, but try it too. And the third test would be to boot using DOS2 instead of Nextor.